He just wouldn’t stay away. 2) mis-reference Fred Penner sung songs. However, just like the yellow cat in ‘The cat came back’ song, the driving or drizzling rain outside is a ‘Meow’ call of return- in this case of spring. 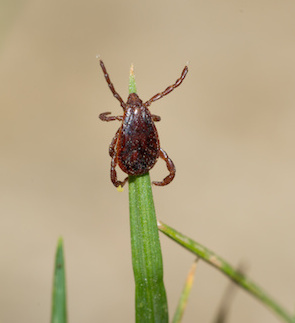 Somewhat less desirable than the thought of spring (and similar to the wails of the reluctant cat-owner in the song), temperatures at and rising above 4’Celsius also mean that ticks have ‘come back’ from their winter nap and are actively seeking a blood meal. This spring, in order to help with the concerns related to tick surge in Canada, there are a few new groups (of humans) forming with specific goals related to obtaining information on and educating about the rise of ticks in (and across ) Canada, tick risk and related disease. Goal to reduce Lyme disease impact on Canadians by uniting various groups (patients, researchers, etc.) in research activities. Performing tick identification (& testing) on ticks found attached to companion animals in order to provide information on tick risk in Canada. An educational website directed at pet-owners to provide information on ticks and tick risks. There are a number of different ways to obtain information related to risk and disease, and sometimes it seems that a focus on working together (i.e. all groups communicating) for key health care goals gets a bit lost in the effort to info-gather. It’s great to see collaboration between veterinarians, vets and pet-owners, and also between vets and those who focus on the 2 legged (i.e. human health care workers-researchers). Working together seems essential (at least IMHO) to provide a One Health perspective, and drive awareness of potential outcomes of tick bites and the consequent need for prevention for all of us- dogs, humans, other mammals and cats…whether you agree with that ear-worm of a song or not.